We’ve been examining the process of post-game chess analysis using the Fritz “family” of playing programs (Fritz, Rybka, Junior, Hiarcs, and Shredder). As we’ve discussed previously, you can have a chess engine analyze every game you’ve ever played but unless you take a close look at that analysis and, most important of all, understand what that analysis is showing you, it’s just a waste of electricity. A chess engine can be a valuable tool for guiding your chess study, but only if you take the time to carefully look at its analysis of your games. As we mentioned last time, you need to have a chess engine analyze many of your games, and then you need to look at the analysis to see if you can spot recurring tendencies in the way you’re losing games. Simply put, a chess engine running in the Fritz/Rybka interface is going to show you two things about your play: the phase of the game in which you tend to be weak (opening, middlegame, endgame) and the way you’re losing games (tactically or positionally). It’s simple enough to spot the phase of the game in which you’re going wrong; you might not even need a chess engine to tell you this. If you’re struggling in the opening, finding yourself in bad positions very early in the game, that tells you that you should study opening principles (not necessarily specific variations, mind you, but general principles of opening play). Likewise you might regularly be getting the whole way into Rook and pawn endings, possibly even with a one or two pawn advantage, but still end up losing consistently. That’s a clear sign that you should be studying endgames (and specifically Rook and pawn endings). Even in these cases, however, a chess engine will provide outside confirmation of these “trouble areas” which you already suspect to be problems. The other aspect of “chess trouble” which a chess engine will illustrate in its analysis (particularly when using the “blundercheck” analysis mode in the Fritz/Rybka interface) is the problem of how you’re losing games: either tactically or positionally (or a combination thereof). In its most basic form this can best be described as whether you’re losing games a sliver at a time or through “WHAM!” moments when the walls fall in as you suddenly lose a pawn (or even a whole piece). If you’re regularly (remember, we’re looking for tendencies here) losing because you’re dropping material (pawns and pieces), you’re tending to lose tactically. The next thing to look for is whether you’re “hanging” pieces/pawns (leaving them completely unguarded) or losing them through combinations (a series of moves in which material for both sides is taken off the board, but which ultimately leaves you on the short end of the bargain). If it’s the “hung pieces syndrome”, another Fritz/Rybka function can help train you to correct this: the “Defense training” feature (under the “Training” tab in the “Positions” part of the ribbon). Either way (whether it’s a case of hung pieces or the short end of combinations), you should also be studying tactics: reading about tactical themes, solving tactics problems, solving “mate in x” puzzles, etc. Just fifteen minutes spent on tactical problems each day can make a profound difference in your play. (And if you’re looking for a whopping huge tactics book, I recommend Laszlo Polgar’s Chess, which contains over 5,000 mate and tactics problems). On the other hand (and I suspect this is where many players, including myself, tend to fall flat), you may discover that your position is being whittled away: a quarter-pawn here, a third of a pawn there, until you’re behind by the positional equivalent of one or two pawns (even though the actual material balance on the board may still be even). This indicates that you should be concentrating your study time on strategic (or “positional”) chess, e.g. structural themes, the kind of thing that Steinitz termed “the accumulation of small advantages”. These themes include pawn structures, piece placements, mobility, tempo, and control of space. Two books which have helped me a great deal in strategic study have been Bruce Pandolfini’s Weapons of Chess (an introductory overview/catalogue of strategic themes) and Ludek Pachman’s Modern Chess Strategy (if any book deserves to be termed a “Bible” of chess strategy, this one is it). There’s also a third possibility here: that a slow erosion of your position leads to that “WHAM!” moment, when the opponent drops the bomb on you and puts you at a material loss. While one could argue that this calls for both types of study (tactical and strategic), I would suggest that a strategic weakness led to the opponent’s tactical opportunity (as Dr. Emanuel Lasker so famously said, positional play is the preparation for combinations), so if one has to choose between concentrating on tactics or strategy I would recommend the latter. Ultimately what you’ll learn from chess engine’s analysis of many of your games is information that should guide your chess study: whether you should concentrate on strategy or tactics, and what phase of the game (opening, middlegame, or ending) you should be studying – and this determination should be based on tendencies that you see repeated in many of your games (not necessarily all of them). 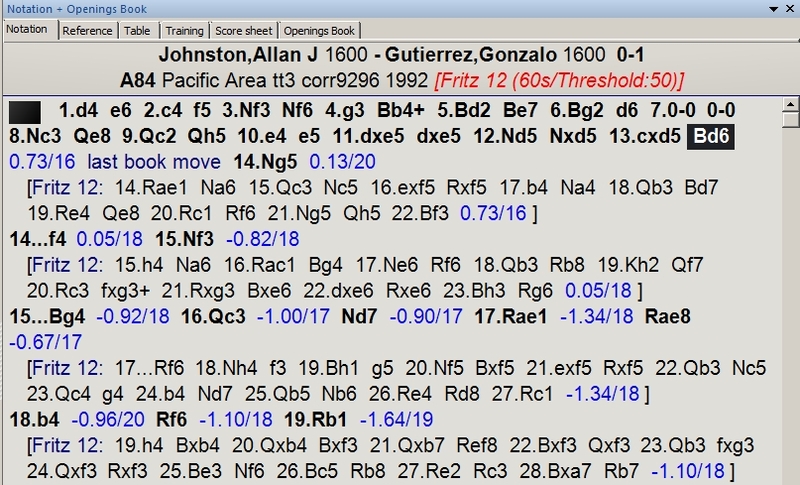 The highlighted move in the game notation above (13…Bd6) is designated as the “last book move” by Fritz12 using Powerbook 2011 as its opening reference; this means that White’s next move wasn’t part of known opening theory. Even though this is a correspondence game (in which players may consult reference materials such as books and databases), it’s still pretty impressive that both players have stuck with established theory for thirteen full moves. Also note Fritz’ assessment of the position after that last book move was played: White is ahead by nearly three-quarters of a pawn. But look what happened after White’s next move (14.Ng5), which some old-school annotators might have termed a “feckless Knight advance”: the chess engine’s positional evaluation indicates that White, with a single move, has lost most of his advantage (going from a big advantage of almost three-quarters of a pawn to a miniscule advantage of just over one-tenth of a pawn). White’s probable intent was to play Ne6 as the follow-up. But if you study Fritz’ suggested variation at this point (beginning with 14.Rae1) you’ll see how White could have made (mostly) quieter moves, built his position slowly, controlled more space, and kept his three-quarters of a pawn advantage. With Black’s next move (14…f4), he blocks the White Knight’s protection by the Bishop, creating an attack by the Black Queen on the Knight. White responds by retreating the Knight right back to f3. As long as White was going to send the Knight out there, why not prop it up with the h-pawn? And look at the numbers after 15.Nf3. In just two moves, White has gone from being ahead by nearly three-quarters of a pawn to being behind by more than three-quarters of a pawn! White has lost space to Black (through the advance of the f-pawn), and has lost time by essentially giving Black a couple of free moves (by pointlessly moving the Knight out and then back; compare the position after 13…Bd6 to the one after 15…Bg4 and you’ll see what I mean). Through an ill-advised premature attack, White has lost the initiative to Black, who is now on his way to establishing an attack of his own. Though it’s not shown in the illustration, White never regains his advantage; in fact, things just get worse for him from here to the end of the game. In looking at this analysis which Fritz generated, what could the White player learn about this game? He missed an opportunity to salvage at least a relatively equal game because he retreated the Knight instead of supporting it. While we can’t make absolute statements about White’s overall chess play on the basis of this single game, we could do so if we saw the same tendencies happen again and again over the course of several games. In such a case, we would conclude that White should study the middlegame in general and positional chess in particular (even though the premature attack would technically fall within the realm of tactics, a knowledge of positional play would have helped White to see the better alternatives available to him, neither of which was tactical in nature). Although it initially sounds contradictory, you have to place each individual game analyzed by Fritz, etc., under the proverbial microscope in order to spot general tendencies over the course of many such analyzed games. You need to look closely at each game to see specifically where you went wrong, then combine this knowledge with that gleaned from other games to make a general determination of your chess weaknesses, which will in turn help you make an informed decision about which areas of the game to concentrate on in your chess studies.